Only in Texas? Or just more proof probation is no walk in the park? Daniel Mirales and his wife Eloise stole from a crime victims fund. She was a 16 year employee of the District Attorney's office. Is this shaming punishment really going to make a difference? And to whom besides the Mireles? 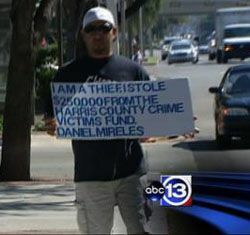 Daniel Mireles walked back and forth on Westheimer in front of the Galleria holding a sign. It read, "I am a thief. I stole $250,000 from the Harris County crime victim's fund. Daniel Mireles."